TAMPA, Fla. (May 9, 2017) – The IRONMAN Foundation® will partner with the U.S. Army Corps of Engineers and Friends of Lake Sonoma for a service project to restore trails and campsites damaged by Northern California’s severe flooding earlier this year. In addition, The IRONMAN Foundation will distribute $25,000 in charitable giveback to non-profit initiatives and groups in the Santa Rosa region in conjunction with the 2017 IRONMAN® 70.3® Santa Rosa triathlon taking place on Saturday, May 13. The service project on Sunday, May 14 will bring together IRONMAN athletes and TriClubs, including three-time IRONMAN World Champion Mirinda Carfrae and her husband, Timothy O’Donnell, a multi-year IRONMAN World Championship top ten finisher, who are both members of the IRONMAN Foundation Ambassador Team. 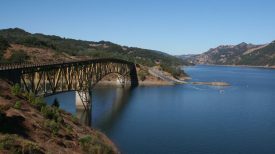 Volunteers will be transported by boat to the remote camping areas of Lake Sonoma to assist with the flood cleanup project.